Scroll to the bottom of the page where it reads Public URL: http://www.hashatit.com/[username] in the text box enter the name you want to use as a URL and then click Submit. 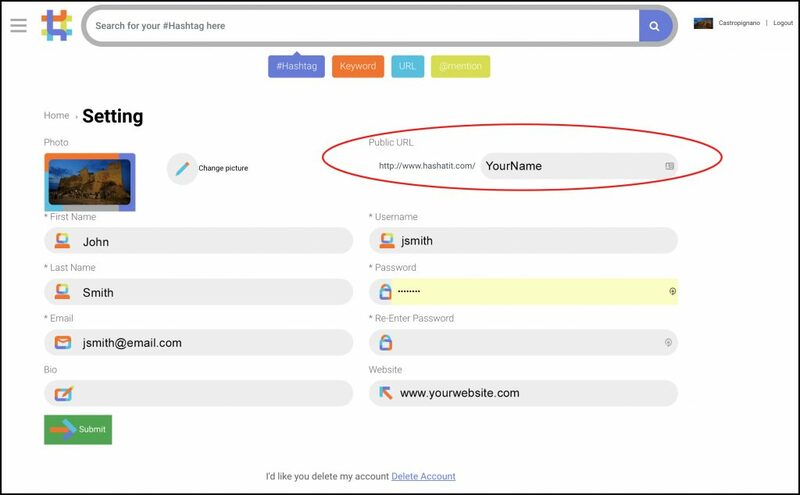 What are Hashatit web Profile URLs? Hashatit web profile URLs is an easy way to view and share your #Hashtag Board! It gives others a look at the #hashtag content you have created on Hashatit. What can I do with Hashatit web URLs? You can share your dashboard with anyone you want via email, or your social media sites like Facebook, twitter and or pinterest. Or you can also place it on your website via our embed code. How do I see my web profile? To see your dashboard, or to explore a friend’s dashboard, simply go to hashatit.com/[username]. For example, in order to view Tito Ortiz’s dashboard, you’d go to hashatit.com/titoortiz on the web.